Waterford & Howell Publishing, 9780578442587, 302pp. If you are struggling ... If you feel as if you and your team are working hard but you are not getting the results you want, you will find hundreds of specific things you can do today to WIN in retail. Throughout the book, look for WIN Today to find those immediate actions you can take to improve your business and win over customers. WIN Today elements act like a retail coach urging you to take steps to improve your retail business. This book helps every retailer and small business owner focus on what really matters. Are a vendor who wants to be a better partner to your retail customers. "It is what has been needed in the retail world: A real world guide based on real experience "
As retail technology spending skyrockets, customer satisfaction with retailers declines. ...Maybe the reason is that the real magic of retail doesn't come from a software program. 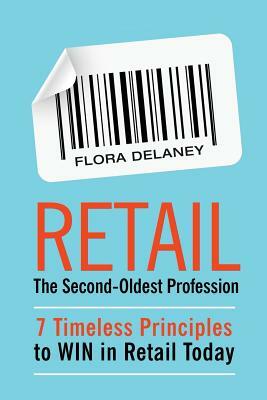 Flora Delaney, retail expert and consultant with experience across the globe helping retailers fix their operations, says retail success comes from just 7 Timeless Principles. "I'm tired of people telling us retail is dead - it is as much a part of our world and culture as ever. When retailersfocus on the 7 Timeless Principles it is a WIN for eveyone - includding their shoppers and their bottom line." At the insistence of past clients, Flora has documented what the best retailers know and how everyday retail employees, department heads and store managers can make their store more profitable as well as a more fun place to work and shop. Like Good to Great and The One Minute Manager, store leaders across every channel are sure to turn to this essential book again and again to answer questions and solve problems. Flora's optimism, easy-to-understand approach and humor energizes senior managers, business owners and casual staff members to make changes to improve their store. About the Author: Flora Delaney is a former retail merchandising executive with over 25 year of experience working for brands as large as Best Buy (US) and Ahold (Europe) and as small as single-store boutiques. As a consultant, she travels the world to help retailers re-discover what makes them successful. She works with store leaders to reinvent their customer experience and create loyal customers and profitability. Her clients include Target, Whole Foods, PetSmart, The Good Guys (Australia), A.S. Watsons (Hong Kong + UK), Family Dollar, Dell, Petco, Sears, and many small chains and nice shops. She is a sought-after speaker at trade events and retail meetings. Flora Delaney is a former retail merchandising executive with over 25 year of experience working for brands as large as Best Buy (USA) and Ahold (Europe) and as small as single-store boutiques. As a consultant, she travels the world to help retailers re-discover what makes them successful. She works with store leaders to reinvent their customer experience and create loyal customers and profitability. Flora’s optimism, easy-to-understand approach and humor energizes senior managers, business owners and casual staff members to make changes to improve their store. Her clients include Target, Whole Foods, PetSmart, The Good Guys (AUS), Family Dollar, Dell, Petco, Sears, and many small chains and nice shops. She is a sought-after speaker at trade events and retail meetings. "Flora Delaney has always been a thought leader and solution provider for successful retailers. This book is a must-read for all of us who works in any capacity in the retail marketplace." "I’ve seen tremendous change in retailing with consolidation, technology advances, and a retailer’s success defined by how they can better meet their customers’ needs and shopping preferences in an increasingly dynamic environment. Flora is an original thinker and identifying insights is part of her DNA. Her book provides practical advice that will improve the operations and business results of any online or brick-and-mortar retailer. "A roadmap that clarifies what is important, and what isn't. A plan that brave companies can use to define who they want to be and create success."